I got a new camera a few days ago. Since this is my first time using a Nikon (after being a Canon Rebel user for years,) I decided to bring it on a trip out of town last week. One of the settings on the camera allows you take miniatures. It takes the scene you are looking at and can apply filters so it looks like you’re looking at a toy scene from far away. I was having a lot of fun with this effect. Here’s one of the pictures of one of the farms we drove by. 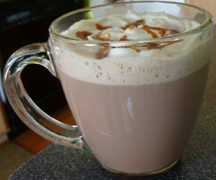 And now, we’re excited to bring a lucky reader a chance to win one of my favorite kitchen appliances! 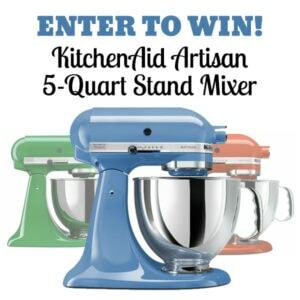 Welcome to the KitchenAid Artisan 5-Quart Stand Mixer Giveaway! We’ve joined forces with a great group of bloggers to bring you this amazing giveaway. One lucky person will win a KitchenAid Artisan 5-Quart Stand Mixer, valued at $350. Easily make your favorite cakes and multiple batches of cookie dough with the 5-quart stainless steel mixing bowl with comfortable handle.